Whether you'd like to fund a specific project or our work generally, you can help us improve the lives of people with learning disabilities. 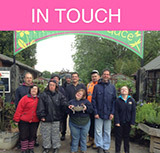 To find out more about our work and our current needs, please call Angela Phipps on 01233 861493 x 241 or [email protected] We'd be delighted to welcome you to our charity to see our work first hand. "The tutor understands Sally so well. He is very creative and knows what activities will motivate her and hold her interest. Her sessions in the wood are the only time she has without care staff. This is very important as it provides an opportunity for her to be more independent. She returns home tired, happy and keen to discuss her day!" "We never cease to be amazed at what Colin has achieved and were reminded of this when we went to the Poulton Wood Open Day and saw the quality of signs that he produces with the obvious assistance of such dedicated staff. We never believed he would be able to achieve something such as that and be so happy in doing it!"